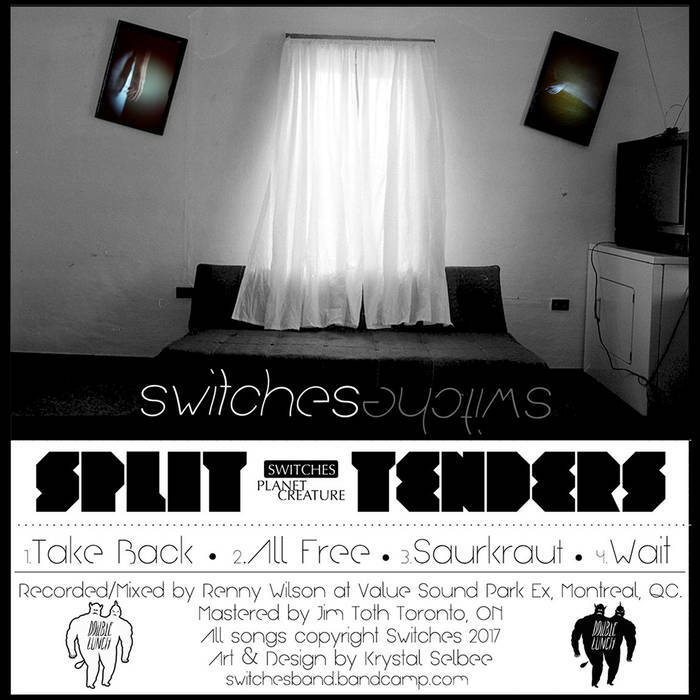 Noisy, gritty, and redolent of haunting ‘60s girl group pop, SWITCHES‘ Split Tenders is a vibrant garage-rock ramble through the ups and downs of modern love. On the album’s opening track, “Take Back,” surges of guitar and drums swell and crash onto us as Tara McMahon’s lusty vocals cut through the rumbling soundscape. The nonchalance in McMahon’s voice when delivering lines like “I guess it’s love, you’re stuck in it now,” feeds Split Tenders’ utterly cool atmosphere. More so, with “All Free,” SWITCHES create a whirlwind track that embodies the excitement and impatience we feel when all we want to do is “go home and be free” with the one we love. Like our attempts to suppress our excitement, the track’s calm and collected drumming tries to subdue the burgeoning speed. To no avail, as the desire to “go home and be free” increases, so does the tempo. Soon a wave of claps herald a newfound restlessness, and the song accelerates into a feverish frenzy. The dynamic energy on Split Tenders gets channeled into an organ-led storm on “Saurkraut.” Bass, guitar, and drums initiate the track’s raucous instrumental with utmost fervor. Yet, once Opryshko’s psychedelic organ-playing pierces through the untamed cacophony, we succumb to the irresistible melody. What’s more, McMahon’s musings of heartbreak, alongside the echoes of ghostly background vocals, continue to captivate us as the track continues to play. Then, on the album’s final track “Wait,” SWITCHES depict the relatable pains of uncertainty by fusing fiery vocals with a fierce instrumental. However, rather than gently fading away, SWITCHES flare up in an eruption of catchy clamor, staying true to their punk core.